Getting # 1 rank in Google Search can be the best thing for your blog and it's not even impossible, but it's not so easy. In this post, I will tell you what to do when you are ranking on the first page but the top 3 is not in search engine positions. How can you get more clicks than the first place on this rank? There are some techniques and methods that you can apply on your blog to get higher CTR (Click To Reach) on Google Search. I have tried some of these factors and also tested and these ways have worked for me and I believe that this will work for you as well. Google Search is just a search and find system for a simple Googler, but as a Blogger and webmasters, we should use the latest search engine ranking factors to get more CTR and top rankings. Here I am sharing some ways that I have implemented in the last few months and it will help you get more search engine clicks for your blog. This is specially for Google Search because it is the most popular search engine and probably the most profitable too. If you are one of the bloggers who write review articles or who review Webhosting or web apps, you can use Google Rich Snippet Star rating to show your review separately. These star ratings work as a ranking of the product you're reviewing and look different. With Star Rating you can easily create review articles and even you can come forward in competitive keyword results as well. With the Star rating, you can also add Call to Action button at the end of the article, this will help you deliver more CTR to the product you are promoting. If you are a tech blogger or blogging in any niche and you review services, product, apps, mobile phones, then use this plugin and you will find good growth in your blog's Google Search CTR. This plugin is one of the highly recommended plugins for affiliate bloggers. You can also create weaks to show date in posts. But hide it from Google Search I use the Thesis theme system to quickly remove date from search engine results and it helps in getting more CTR for older posts. If you are doing poor CTR notice in old posts, then my recommendation is that you remove dates from Google SERP's for your blog post and you will start doing a different notice. It should have been the first tip here but due to being the oldest I kept it here in the last. Google and most other search engines use your meta title and meta description to show information in Google Search. Writing Meta title will not only improve the CTR, but by writing a detailed meta description, you will also give a better ranking with the keyword. You can use the WordPress SEO by Yoast plugin or if your theme post offers SEO options, you can also use it in writing Meta post titles and description which will help you increase Google Search CTR. 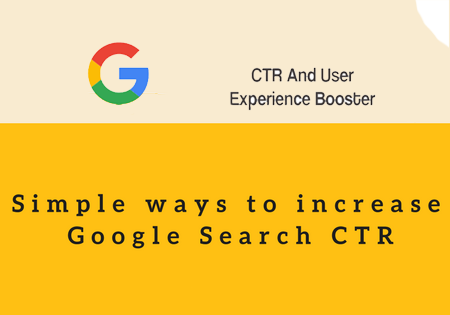 Some other factors like Google Plus "Likes" or video thumbnails and instant previews also help maximize CTR in Google searches. But for now, if you implement the latest SEO techniques above, then you are improving the ways that Google search has listings of your blog posts. If you are using another technique to get a better CTR in organic search then tell me in the comment section.